Product information "Anti-ANGPTL7 (human), clone Kairos 108-4"
Recognizes human ANGPTL7. 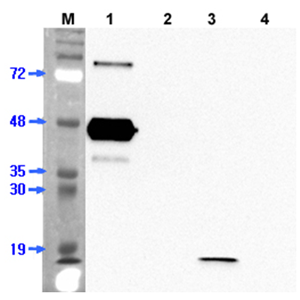 Detects a band of about 45kDa by Western blot. Weakly cross-reacts with human ANGPTL7-CCD. Liquid. 0.2µm-filtered solution in PBS, pH 7.4. Contains no preservatives. ANGPTL7 is expressed in various tissues and regulates angiogenesis. Human ANGPTL7 was characterized as a potent target gene of the WNT/ beta-catenin signaling pathway, and is a pharmacogenomics target in the fields of oncology and regenerative medicine. Immunogen: Recombinant human full length ANGPTL7. Customer review for "Anti-ANGPTL7 (human), clone Kairos 108-4"